At a recent Racial Justice Allies meeting we were talking about how to be an effective ally and a member mentioned her friend who had allied herself with the Malcolm X Grassroots Movement, “an organization of Afrikans in America/New Afrikans whose mission is to defend the human rights of our people and promote self-determination in our community.” As a white woman, the friend took on the job of performing research to further the aims of the organization. Shortly after our meeting, the member circulated a link to the report produced from her friend’s research, a 130-page book, Operation Ghetto Storm: the 2012 Annual Report on the Extrajudicial Killing of 313 Black people by Police, Security Guards, and Vigilantes. I downloaded the report and looked through it, impressed by the clarity of presentation—analysis, graphs and statistics, and a chart listing each of the 313 black people killed in 2012 along with information on what happened during and after the killing. This report was exactly what I had wanted to have during many discussions, especially in my classroom (I teach at a community college) where so often the current horrendous incident gets dismissed as an aberration. I would argue that the latest killing of a young black man by police was one among many, an expected outcome of white supremacist institutions, but not have statistics to demonstrate this. So I uploaded the PDF file of the book to my local copy shop and had a few copies printed and spiral bound. I have a copy on my coffee table where friends have picked it up and inevitably continued to leaf through it, caught up in the analysis and then the stories of those 313 people’s death. It will be circulated in my American Cultures class. Racial Justice Allies will have books at our events. I am passing copies along to friends I know will circulate them in their circles. And I am hoping that those of you reading this blog post will be inspired to download Operation Ghetto Storm, print out a few copies, and circulate it in your community. Maybe even get a local bookstore to carry it (after checking with Malcolm X Grassroots Movement to make sure it’s OK). I see this book as an important tool for any activist/ally engaged in demonstrating the existence of the white supremacist system we live in. Why have physical, printed copies when anyone can read it online? Following up a link to see something online requires prior interest. This book has a dynamic cover that catches attention. Then it’s easy to glance through it. Even the folks at the print shop have been exposed to some of the information. Perhaps it’s generational, but for me a book has more solidity and substance than an online publication. At the least, try printing out a copy (cost to me was $14 with a color cover and black-and-white interior) and see what happens. 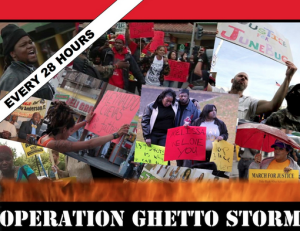 You can download Operation Ghetto Storm here. One Response to "Operation Ghetto Storm"
Calling all places of worship, fraternities/sororities, organizations, businesses – any place where groups of people gather regardless of color and denomination – Why not establish an action group to teach youth how to respond when confronted by the Zimmermans of the world? During The Civil Rights Movement, the youth were trained how to respond to racist attacks and none of them (to my knowledge) were ever accused by the press of being hostile. We need to find those manuals and those who learned from them and be taught because it’s so easy to accuse the victim of the crime when he/she is dead. Everyday, people are listening to hate-talk radio and, just like in Germany during the 30s and 40s, people are described as a drain on the society and viewed as pests to be eradicated. That makes it easy and it seems that some people have learned a lot from Hitler and The Third Reich. When I was a teacher, my students were alarmed reading Elie Weisel’s, NIGHT. I wanted them to think and discuss how and why it happened and whether it could happen again. Well, it is and in many ways. We all can come up with ways to end this. I am just one. Think about it because if we don’t do something to stop this, one day, the only place to see members of the black group of people will be in museums. In this case, ignorance is not bliss, it is suicide. Knowledge and action is power.